Having mentioned the Southern revival meeting briefly last time, it seemed good to look at how one Orthodox saint, Holy Nazarius of Valaam, approached the idea of ‘revival’. But before that, let us look a little more closely at the idea of revivals overall. In the South and other Western countries, Protestant revivals usually use a combination of prayer, music, and preaching to induce a mood in which one will experience a ‘Damascus Road’ experience of conversion or re-conversion at the climax-crescendo of the meeting. Emotional outpourings are the usual result - and sometimes other manifestations like jerking, running, rolling, etc. Lost is the quiet, reflective, sober-mindedness that Orthodox practices tend to create in people. As for special revival-type services, the Orthodox Church really hasn’t got much need for them. She has within her holy calendar already certain days and seasons that call the faithful to more vigilance and repentance throughout the year: for ensample, fasting twice a week most weeks, and Lenten seasons before Easter, Sts Peter and Paul, Dormition, and Christmas, where not only eating restrictions are taken up but also more reading of Holy Scripture and other Christian books, more prayers, more almsgiving, more church services, and so on. As in other areas, then, the South has a good desire (in this case, a reinvigorated Christian life), which finds its fulfilment in the practices of the Orthodox Church. The following excerpt is from the Life of Abbot Nazarius of Valaam and Sarov, which was compiled and translated by Hieromonk Seraphim (Rose) of blessed memory from material published in the late 19th century by Valaam and Sarov Monasteries. 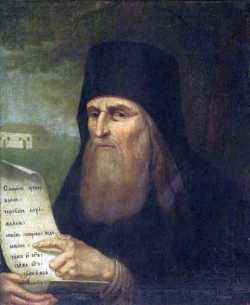 The full life, along with the soul-profiting instructions of the spiritual elder who instructed both St. Herman of Alaska and St. Seraphim of Sarov can be found in Little Russian Philokalia, Vol. II: Abbot Nazarius (Platina: St. Herman of Alaska Brotherhood) 1983. In 1801, having earned well a rest from the heavy burden of governing the monastery, Fr. Nazarius retired for a life of solitude and divine vision a mile inland from the monastery. While he was still abbot he had had a cell built for him, where he occasionally would retire in silence. But his love for Sarov Monastery, the place where he had laid his ascetic beginnings and given his monastic vows, kept summoning him to return there. So, after three years of seclusion in Valaam, he decided to retire to Sarov. He took with him his disciple, Fr. Ilarion, bade farewell to Valaam, and crossed the waters of Ladoga. At one of the rest halts the following incident occurred, which vividly illustrates the power of Fr. Nazarius’ Orthodoxy in practice. The bell was sounded for the Vigil and the service began. And indeed, in the beginning there was no one in church. Then no more than ten people gathered in church, old men and women. Fr. Nazarius read the Six Psalms, and Fr. Ilarion the Kathismata. After the reading of the Gospel, it was brought out to the middle of the church. Fr. Nazarius and Fr. Ilarion went to reverence and kiss it, but those present, out of habit, did not do so. The Elder went up to them and explained to them concerning the benefit of the sanctification to be received at this moment from venerating the Holy Gospel. And the old people came, kissed the Gospel, and thanked the Elder. Father Nazarius spoke with them and advised them to tell those at home and their neighbors how profitable it is to participate in the Divine services and be sanctified by venerating and kissing the Holy Gospel as well as other holy objects in church. After the Sixth Song of the Canon Fr. Nazarius read from the spiritual instructions of the Prologue. Several of the old people managed to go home and call their own people to church, until some thirty people had gathered. As the people left the church, the Elder spoke with them on the necessity and benefit of praying in God’s temple. In the morning the priest celebrated the Divine Liturgy, and Father Nazarius, at the time of the sermon, read from a book of spiritual instruction; rather more people were in attendance at the Liturgy than had come to the Vigil. Having rested after dinner, the Elder saw that many people had gathered in the yard around the church, and the priest explained that on all holy days the people gather for their own amusement. “Let us go too,” said Fr. Nazarius to the priest. “Take the book of the Lives of Saints.” Having chosen a convenient place near the church, they sat down, and the Elder had the priest read out loud the Life of the saint commemorated that day. The old people were glad to see Fr. Nazarius after having made his acquaintance the night before, and were the first to go to him. He persuaded them to sit down and listen to the Life of the saint. Once in a while he stopped the reading and himself gave instructive comments. The number of listeners increased, and Fr. Nazarius rejoiced with his whole heart that Orthodox people had been awakened to listen to spiritual converse. The next day was the Feast of the Tikhvin Icon of the Mother of God, and the priest, at the advice of the Elder, celebrated both the All-night Vigil and the Liturgy, as he did also on all the succeeding feast days. The parishioners showed their evident disposition toward prayer, their number at the church’s Divine services increasing from day to day. Fr. Nazarius, persuaded by the priest, spent more than two weeks there, not omitting a single opportunity of conversing with and instructing in true Christian piety both the peasants of this village and those who came to the Elder from neighboring places to take advantage of his instruction; and everyone came to have a heartfelt love for him. The priest, having become his spiritual son, fulfilled his counsels with all zeal, and he saw in Fr. Nazarius a God-sent tool both for his own salvation and for that of his flock. The Elder, bidding farewell to the priest and the parishioners, went on his way. Some time later, after some deviations in their route, the travellers decided to pass through that village again and without fail to visit the priest; and it so happened that they came to the village while the bells were ringing for the Liturgy on Sunday morning. The people, gathered in large numbers at the church, saw the approaching Elder and almost took him from his cart and carried him into the church. The priest, gladdened by his arrival, was serving the Proskomedia. With tears the Elder thanked the Lord for such a grace-filled change, noting that the church was full of people. The people with reverence crowded around the Elder to receive his blessing, and the priest, having celebrated the Divine Liturgy, and embracing the Elder, indicated to him their mutual joy and told those who stood nearby that such a great gathering of people was the fruit of Fr. Nazarius’ prayers. The church could no longer hold the multitude of people, who filled even the church steps. Having spent some time in that village, Fr. Nazarius begged both the pastor and his flock to continue and grow from this good beginning, devoutly fulfilling their obligations. Then Fr. Nazarius made ready to depart. He was accompanied with tears by the priest with all his parishioners, who had gathered to bid farewell to their Elder, Father, and benefactor (for so they began to call him). They accompanied him for several miles from the village, and the priest remained in correspondence with Fr. Nazarius and to his very death took advantage of his counsels. Holy Abbot Nazarius of Valaam, pray for us sinners! Some things on the list are praiseworthy and needful for a healthy Christian life; others are more evidence of self-centered consumerism burrowing into churches more deeply than ever. But the fact that receiving Holy Communion, which is at the heart of Christian life and worship, did not make the list at all is telling. This shows that there is grave confusion here in the States over just what the Christian life is about. It is thought of by most as either an increase in one’s rational knowledge of God or an emotional feeling toward Him. Preaching was regarded as one of the ordinary means of grace. Of the special or “extraordinary” means employed by Southern evangelicals in bringing about a revival, camp meetings and protracted meetings were the most important (Southern Evangelicals and the Social Order: 1800-1860, Baton Rouge, La. : LSU Press, 1980, pgs. 71-2). But the Orthodox Church, over against the Western denominations, whether Roman Catholic or Protestant, does not limit Christianity to the possibilities of fallen human relationships, i.e., limiting it to external, sense-driven experiences (the beatific vision of God’s essence in Roman Catholicism, an eternal dialogue per Michael Novak, praising God forever with the mouth in Heaven (most Protestants), the flirtatious mysticism of Catherine of Sienna, etc.). The Orthodox focus is rather on union with the Supremely Personal God through the Holy Eucharist, a union that nevertheless preserves the unique personhood of each.
. . . St John [Chrysostom] hears Christ speaking to him: ‘I am not simply joined with you; I am interwoven, I am eaten, I am attenuated little by little, so that the mixing, the interweaving and the union can be greater. For things that are joined preserve their own boundaries, whereas I am interwoven with you. I do not want there to be anything between us. I want the two to be one.’ Between Christ and the Christian there is no longer anything intervening. Everything dissolves in the light of His love: ‘We and Christ are one’ (Hieromonk Gregorios, The Divine Liturgy, tr. Theokritoff, Columbia, Mo. : Newrome Press, 2012, p. 24). When a Christian partakes of Communion, who can comprehend the gifts and the charismata he receives? Or how can our inept tongue enumerate them? For this reason, let us again bring forward one by one the sacred teachers of the Church to tell us about these gifts, with their eloquent and God-inspired mouths. Brothers, let us practice stillness, fasting, prayer, and tears; gather together in the Church; work with our hands; speak about the Holy Fathers; be obedient to the truth; and listen to the divine Scriptures; so that our minds do not become barren (and sprout the thorns of evil thoughts). And let us certainly make ourselves worthy of partaking of the divine and immaculate Mysteries, so that our soul may be purified from thoughts of unbelief and impurity, and so that the Lord will dwell within us and deliver us from the evil one. Tears and contrition have great power. But the Communion of the sanctified Gifts, above all, has especially great power and benefit, and, seeing that you are so indifferent towards it and do not frequently receive it, I am in wonder and great amazement. For I see that you only receive Communion on Sundays, but, if there is a Liturgy on any other day, you do not commune, though when I was in the monastery each one of you had permission to commune every day, if you so desired. But now the Liturgy is less frequently celebrated, and you still do not commune. I say these things to you, not because I wish for you simply to commune—haphazardly, without preparation (for it is written: ”But let a man examine himself, and so let him eat of the Bread, and drink of the Cup. For he that eateth and drinketh unworthily, eateth and drinketh damnation to himself, not discerning the Lord’s body and blood” [1 Cor. 11:28-29]). No, I am not saying this. God forbid! I say that we should, out of our desire for Communion, purify ourselves as much as possible and make ourselves worthy of the Gift. For the Bread which came down from heaven is participation in life: ”If any man eat of this bread, he shall live for ever: and the bread that I will give is My flesh, which I will give for the life of the world” (Jn. 6:51). Again He says: ”He that eateth My flesh, and drinketh My blood, dwelleth in Me, and I in him” (Jn. 6:58). We know that many Southerners and others in the lands of Western civilization really do want to be as close as possible to Christ. So in addition to listening to sermons, serving the poor, etc. (which are no doubt good for the soul and body), they should hurry into the Orthodox Church to receive the Grace-filled Body and Blood of our Lord Jesus Christ, that they might know Him, together with the Father and the Holy Ghost, in the deepest way possible. The South, Cortes is telling us, instead of delighting in her republicanism, ought to be searching for an alternative to it, since it can only be a brief, wavering stage in her history, not something of permanence and stability. One of the reasons this is so, as Cortes said elsewhere, is that republicanism is a denial of God’s rule over this world (e.g., ‘Discourse on the General Situation of Europe’, speech given to the Spanish Parliament on 30 Jan. 1850, found in Donoso Cortes: Readings in Political Theory, Herrera, edr., Ave Maria, Flor. : Sapientia Press, 2007, pgs. 74-5). If we believed in His providence, we would have no trouble believing that He would provide a king to govern each nation according to His will. But since at some level we really do not believe in that anymore, we have taken the reins of government into our own hands, relegating to God the role merely of Creator of the cosmos, while we ourselves are now the rulers. The Liberalism we shall describe in the following pages is not--let us state at the outset--an overt Nihilism; it is rather a passive Nihilism, or, better yet, the neutral breeding-ground of the more advanced stages of Nihilism. Those who have followed our earlier discussion concerning the impossibility of spiritual or intellectual "neutrality" in this world will understand immediately why we have classified as Nihilist a point of view which, while not directly responsible for any striking Nihilist phenomena, has been an indispensable prerequisite for their appearance. The incompetent defence by Liberalism of a heritage in which it has never fully believed, has been one of the most potent causes of overt Nihilism. The Liberal humanist civilization which, in Western Europe, was the last form of the Old Order that was effectively destroyed in that Great War and the Revolutions of the second decade of this century and which continues to exist--though in an even more attenuated "democratic" form--in the free world today, may be principally characterized by its attitude to truth. This is not an attitude of open hostility nor even of deliberate unconcern, for its sincere apologists undeniably have a genuine regard for what they consider to be truth; rather, it is an attitude in which truth, despite certain appearances, no longer occupied the center of attention. The truth in which it professes to believe (apart of course, from scientific fact) is, for it, no spiritual or intellectual coin of current circulation, but idle and unfruitful capital left over from a previous age. The Liberal still speaks, at least on formal occasions, of "eternal verities," of "faith," of "human dignity," of man's "high calling" or his "unquenchable spirit," even of "Christian civilization"; but it is quite clear that these words no longer mean what they once meant. No Liberal takes them with entire seriousness; they are in fact metaphors, ornaments of language that are meant to evoke an emotional, not an intellectual, response--a response largely conditioned by long usage, with the attendant memory of a time when such words actually had a positive and serious meaning. No one today who prides himself on his "sophistication"--that is to say, very few in academic institutions, in government, in science, in humanist intellectual circles, no one who wishes or professes to be abreast of the "times"--does or can fully believe in absolute truth, or more particularly in Christian Truth. Yet the name of truth has been retained, as have been the names of those truths men once regarded as absolute, and few in any position of authority or influence would hesitate to use them, even when they are aware that their meanings have changed. Truth, in a word, has been "reinterpreted"; the old forms have been emptied and given a new, quasi-Nihilist content. This may easily be seen by a brief examination of several of the principal areas in which truth has been "reinterpreted." In the theological order the first truth is, of course, God. Omnipotent and omnipresent Creator of all, revealed to faith and in the experience of the faithful (and not contradicted by the reason of those who do not deny faith), God is the supreme end of all creation and Himself, unlike His creation, finds His end in Himself, everything created stands in relation to and dependence upon Him, Who alone depends upon nothing outside Himself, He has created the world that it might live in enjoyment of Him, and everything in the world is oriented toward this end, which however men may miss by a misuse of their freedom. The modern mentality cannot tolerate such a God. He is both too intimate--too "personal," even too "human"--and too absolute, too uncompromising in His demands of us; and He makes Himself known only to humble faith--a fact bound to alienate the proud modern intelligence. A "new god" is clearly required by modern man, a god more closely fashioned after the pattern of such central modern concerns as science and business; it has, in fact, been an important intention of modern thought to provide such a god. This intention is clear already in Descartes, it is brought to fruition in the Deism of the Enlightenment, developed to its end in German idealism: the new god is not a Being but an idea, not revealed to faith and humility but constructed by the proud mind that still feels the need for "explanation" when it has lost its desire for salvation. This is the dead god of philosophers who require only a "first cause" to complete their systems, as well as of "positive thinkers" and other religious sophists who invent a god because they "need" him, and then think to "use" him at will. Whether "deist," "idealist," pantheist," or "immanentist," all the modern gods are the same mental construct, fabricated by souls dead from the loss of faith in the true God. The Liberal view of government, as one might suspect, is an attempt at compromise between these two irreconcilable ideas. In the 19th century this compromise took the form of "constitutional monarchies," an attempt--again--to wed an old form to a new content; today the chief representatives of the Liberal idea are the "republics" and "democracies" of Western Europe and America, most of which preserve a rather precarious balance between the forces of authority and Revolution, while professing to believe in both. It is of course impossible to believe in both with equal sincerity and fervor, and in fact no one has ever done so. Constitutional monarchs like Louis Philippe thought to do so by professing to rule "by the Grace of God and the will of the people"--a formula whose two terms annul each other, a fact as equally evident to the Anarchist  as to the Monarchist. Now a government is secure insofar as it has God for its foundation and His Will for its guide; but this, surely, is not a description of Liberal government. It is, in the Liberal view, the people who rule, and not God; God Himself is a "constitutional monarch" Whose authority has been totally delegated to the people, and Whose function is entirely ceremonial. The Liberal believes in God with the same rhetorical fervor with which he believes in Heaven. The government erected upon such a faith is very little different, in principle, from a government erected upon total disbelief, and whatever its present residue of stability, it is clearly pointed in the direction of Anarchy. A government must rule by the Grace of God or by the will of the people, it must believe in authority or in the Revolution; on these issues compromise is possible only in semblance, and only for a time. The Revolution, like the disbelief which has always accompanied it, cannot be stopped halfway; it is a force that, once awakened, will not rest until it ends in a totalitarian Kingdom of this world. The history of the last two centuries has proved nothing if not this. To appease the Revolution and offer it concessions, as Liberals have always done, thereby showing that they have no truth with which to oppose it, is perhaps to postpone, but not to prevent, the attainment of its end. And to oppose the radical Revolution with a Revolution of one's own, whether it be "conservative," " non-violent," or "spiritual," is not merely to reveal ignorance of the full scope and nature of the Revolution of our time, but to concede as well the first principle of that Revolution: that the old truth is no longer true, and a new truth must take its place. Our next chapter will develop this point by defining more closely the goal of the Revolution. In the Liberal world-view, therefore--in its theology, its ethics, its politics, and in other areas we have not examined as well--truth has been weakened, softened, compromised; in all realms truth that was once absolute has become less certain, if not entirely "relative." Now it is possible-and this in fact amounts to a definition of the Liberal enterprise-to preserve for a time the fruits of a system and a truth of which one is uncertain or skeptical; but one can build nothing positive upon such uncertainty, nor upon the attempt to make it intellectually respectable in the various relativistic doctrines we have already examined. There is and can be no philosophical apology for Liberalism; its apologies, when not simply rhetorical, are emotional and pragmatic. But the most striking fact about the Liberal, to any relatively unbiased observer, is not so much the inadequacy of his doctrine as his own seeming oblivion to this inadequacy. This fact, which is understandably irritating to well-meaning critics of Liberalism, has only one plausible explanation. The Liberal is undisturbed even by fundamental deficiencies and contradictions in his own philosophy because his primary interest is elsewhere. If he is not concerned to found the political and social order upon Divine Truth, if he is indifferent to the reality of Heaven and Hell, if he conceives of God as a mere idea of a vague impersonal power, it is because he is more immediately interested in worldly ends, and because everything else is vague or abstract to him. The Liberal may be interested in culture, in learning, in business, or merely in comfort; but in every one of his pursuits the dimension of the absolute is simply absent. He is unable, or unwilling, to think in terms of ends, of ultimate things. The thirst for absolute truth has vanished; it has been swallowed up in worldliness. Comparing Rev Dabney’s words from last time with this passage, clearly the South was heading in the right direction in the years prior to the War. There were even calls in some quarters for the restoration of a monarchy in the South as secession loomed. It is unfortunate, to say the least, that these developments were interrupted by the War, Reconstruction, and their aftermath. Howsobeit, liberalism is what Dixie has ended up with, but, as much as possible, republics and their kin ought not to be befriended, per the above. To use the imagery of the family, the republican system is like the children gathering together ‘in convention’ and deciding that they would expel their God-given father and rule themselves according to a ‘constitution’ of their own making. Such a thing is demonically inspired and of course would end in the worst chaos, but it is what the South and most European countries have done politically with their kings: The disorder and brutality of the modern world are testimony to it. Let us hear once more from Cortes: ‘Gentlemen, the true cause of the deep and profound evil which afflicts Europe is that the ideas of divine and human authority have disappeared. . . . Because of this, peoples are ungovernable. . . . In the nations which are ungovernable, the government necessarily takes republican forms’ (‘Discourse on the General Situation of Europe’, p. 73). However, buried beneath the republicanism overlying the South of today lies the foundation of patriarchy (M. E. Bradford, ‘The Colonial Origins of the Southern Tradition’, A Better Guide Than Reason, New Brunswick, Nj. : Transaction, 1994, p. 179). It is mostly forgotten or mostly despised now by the worshippers of modern freedom, but it is there nevertheless. And with proper care and nurture, it could be restored. To bring back the landed aristocracy of the Old South would be a great improvement over the atomistic conditions of today, but to have them without a king is to have an arch without a capstone. Every family has a God-given head - a father; every nation, which is an extended family, will also have a God-given head - a king. The fulfillment of patriarchy is a king. ‘To the cultural anthropologist monarchy is a patriarchal institution. Its underlying ideology is thus “familistic.” The ideal monarch is a father—a concept expressed in the symbolic pictorial representation of kings and emperors’ (Erik von Kuehnelt-Leddihn, Liberty or Equality, Front Royal, Va.: Christendom Press, 1993, p. 138, italics in original). §. 65. At last the King was traiterously beheaded in England, and Oliver install'd Protector. However, his Authority was not acknowledged in Virginia for several Years after, till they were forced to it by the last Necessity. For in the Year 1651, by Cromwell's Command, Capt. Dennis, with a Squadron of Men of War, arriv'd there from the Carribbee Islands, where they had been subduing Bardoes. The Country at first held out vigorously against him; and Sir William Berkeley, by the Assistance of such Dutch Vessels as were then there, made a brave Resistance. But at last Dennis contriv'd a Stratagem, which betray'd the Country. He had got a considerable Parcel of Goods aboard, which belong'd to Two of the Council; and found a Method of informing them of it. By this means they were reduced to the Dilemma either of submitting, or losing their Goods. This occasion'd Factions among them; so that at last, after the Surrender of all the other English Plantations, Sir William was forced to submit to the Usurper on the Terms of a general Pardon. However, it ought to be remember'd, to his Praise, and to the immortal Honour of that Colony, that it was the last of all the King's Dominions that submitted to the Usurpation, and afterwards the first that cast it off. §. 68. The strange Arbitrary Curbs he put upon the Plantations, exceedingly afflicted the People. He had the Inhumanity to forbid them all manner of Trade and Correspondence with other Nations, at a Time when England it self was in Distraction; and could neither take off their Commodities, nor supply them sufficiently with its own. Neither had they ever been used to supply them with half the Commodities they expended, or to take off above half the Tobacco they made. Such violent Proceedings made the People desperate, and inspired them with a Desire to use the last Remedy, to relieve themselves from his Lawless Usurpation. In a short time afterwards a fair Opportunity happen'd: For Governor Mathews died, and no Person was substituted to succeed him in the Government. Whereupon the People apply'd themselves to Sir William Berkeley, (who had continued all this time upon his own Plantation in a private Capacity) and unanimously chose him their Governour again. §. 69. Sir William Berkeley had all along retain'd an unshaken Loyalty for the Royal Family; and therefore generously told the People, That he could not approve of the Protector's Oppression; and was resolved never to serve any Body, but the lawful Heir to the Crown; and that if he accepted the Government, it should be upon their solemn Promise, after his Example to venture their Lives and Fortunes for the King, who was then in France. This was their dearest Wish, and therefore with an unanimous Voice they told him, That they were ready to hazard all for the King. Now, this was actually before the King's Return for England, and proceeded from a brave Principle of Loyalty, for which they had no Example. Sir William Berkeley embraced their Choice, and forthwith proclaim'd Charles the Second King of England, Scotland, France, Ireland and Virginia, and caused all Process to be issued in his Name. Thus his Majesty was actually King in Virginia, before he was so in England. But it pleased God to restore him soon after to the Throne of his Ancestors; and so that Country escaped being chastised for throwing off the Usurpation. In determining our duty in this emergency it is necessary that we should first ascertain the nature of the trust providentially committed to us. A nation often has a character as well defined and intense as that of an individual. This depends, of course upon a variety of causes operating through a long period of time. It is due largely to the original traits which distinguish the stock from which it springs, and to the providential training which has formed its education. But, however derived, this individuality of character alone makes any people truly historic, competent to work out its specific mission, and to become a factor in the world's progress. The particular trust assigned to such a people becomes the pledge of the divine protection; and their fidelity to it determines the fate by which it is finally overtaken. What that trust is must be ascertained from the necessities of their position, the institutions which are the outgrowth of their principles and the conflicts through which they preserve their identity and independence. If then the South is such a people, what, at this juncture, is their providential trust? I answer, that it is to conserve and to perpetuate the institution of domestic slavery as now existing. . . .
Rather than the perfection of the Christian republic (a contradiction in terms, as we have seen) that Rev J. H. Thornwell and others thought so important, the role of the South in the world, particularly in the West where liberalism has caused so much havoc, is to help call it back to Christian hierarchy/monarchy. This is what we need to understand about the South’s defense of slavery: Only superficially was it a defense of the subjugation of black Africans to white Europeans. At the core of the slavery argument was the idea of upholding sacred order (i.e., hierarchy) against modern nominalism, wherein the divinely ordained ghostly and matterly union of everyone and everything is broken apart and replaced with the beastly ‘cash nexus’ spoken of by Richard Weaver. It should be kept in mind that we are not advocating for the stripping away of anything good in Southern political tradition, only the adding back of something essential that was taken away more than 200 years ago. Other institutions would of course exist alongside the king, cooperating with him in governing the people, among them venerable old bodies like the Senate, county courthouses, and so on. The Southern king we could reckon to be fairly mild in his rule as well, as most gentlemen-planters before the War were of the easy-going kind. We do not fault anyone for their ardent defense of republican forms of government. It is simply what has been preached as correct doctrine for hundreds of years now, which makes it easy for folks to get caught up in the strong currents of the times and swept away by them (we ourselves were also quite enamored with them at one time). But with a little deeper look into history and theology, we hope most Southerners will come back home to Christian hierarchy and kingship - as our forefathers Sir William Berkeley, Rev Palmer, and others are asking us to do, as well as more recent Southern leaders like Richard Weaver and Wendell Berry - for the sake of the South and, by way of example, for the sake of others who have imbibed the deceptive ideologies of Modernity.